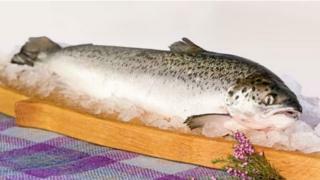 Strong market prices lifted The Scottish Salmon Company towards the end of last year as the firm continued to struggle with industry-wide "biological challenges and mortalities". The firm said health issues impacted on expected harvest volumes and drove up production and operating costs by 15%, to £26m, in the last quarter of 2016. Harvested volumes fell year-on-year from 6,059 tonnes to 5,733 tonnes. However, revenues rose over the same period by £3.3m to £27.2m. Over the year, revenue reached £110m, compared with £100.4m in 2015. The salmon farming industry has been trying to tackle the problem of sea lice, which have led to a cut in output, rising costs and price rises. Sea lice are small marine parasites that feed on the skin and blood of salmon. They can weaken the health of fish and its growth. In a statement, the Edinburgh-based company said it had focused on increasing capacity and improving operational efficiency in the last quarter. Trials on its new harvest station in Ardyne, Argyll, were completed and the facility became fully operational in January. In addition, a number of smaller farms in the north were consolidated into a single 3,400 tonne operating site, which the company said improved efficiencies and economies of scale. Export sales accounted for 44% of output, an increase of 7%, as the firm continued to target overseas markets. Chief executive Craig Anderson said: "Performance has remained stable but we recognise that the effects of recent health issues have impacted on our projected growth in the short term. "Taking into account the consequences of the current biological challenges, we are now guiding harvest volumes of 25,000 tonnes volumes for 2017."